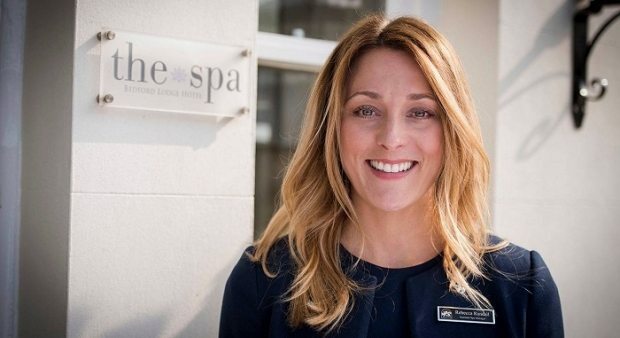 The Spa at Bedford Lodge Hotel has appointed experienced spa professional, Rebecca Randall, as Spa Manager. Rebecca will oversee our luxurious five Bubble certified spa which boasts 10 relaxing treatment rooms, a naturally-lit and welcoming spa and rooftop hot tub area. She will also be responsible for managing our team of 12 therapists, overseeing upcoming improvements at the spa and maintaining the high service and standards the spa has become known for. With 18 years of health and beauty industry experience, Rebecca’s promotion is an exciting addition to the spa management team, with lots of upcoming developments for the spa planned to take place this year. Working as Assistant Manager previously, Rebecca’s work supporting the training of new spa therapists has helped to improve the operations behind the scenes which has contributed to the spa’s positive reputation. Her first goal is to continue to expand the therapist team and build upon the positive team ethic already at The Spa. Now as Spa Manager, Rebecca is taking steps to create a scheme of incentives for the team to help reward them for their hard work and dedication. Rebecca’s previous retail background working with Dermalogica will help her to directly support and advise the spa team and customers on the large range of ESPA products available here at the spa . Rebecca’s next steps will also include working to build the aesthetics side of The Spa which is due to launch later this year. Rebecca joined The Spa at Bedford Lodge Hotel as Assistant Manager last year, after owning a Beauty Salon for five years, bringing both valuable experience and passion to all of her ambitious goals moving forwards.